Up until the 14th century, drawing did not have its own standing. Drawing allows an artist the creative liberty and widest possible scope. It also brings out the personality of the creator. Drawing is an art and to get started in the drawing, you need to start with basic and easy to draw figures and objects. 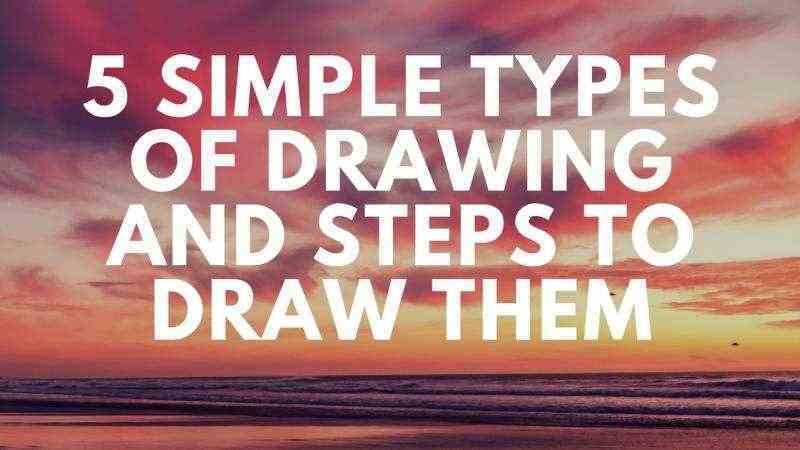 In this article, we will discuss five super simple types of drawing that you must try. Along with the drawing types, you also know about the steps to draw these drawings. Before starting to draw a flower, you need to think of the flower pattern you want to draw. Start with drawing three small circles in a triangle format with one circle resting on the pit created by two joined circles. Extend three straight lines from the vortex of joint of all three circles. These lines should be open angle equilateral triangle. Create paisley patterns on either side of the lines to create petals. Extend the lines for leaves. To draw leaves, make half oval marks with pointed ends on either side of the straight lines. Keep these pointed ovals to three leaves. From any of the petals, draw freehand parallel lines to create the stem or vine of the flower. The vine should look as if it is visible from behind of the petals. To show more leaves, draw small Mobius strips with small leaves to create the depth of a background. First, you need to draw the whole stem, bark, and trunk of the tree. For this draw an elongated A which has a broad base and tapers to the top. Do not create a vortex. For branches, you need to draw freehand style wavy lines which are perpendicular to the trunk of the tree. Draw smaller branches attached to the main branches. Wither you can go for leaves or you can go for flat cloud patterns to create the effect of leaves. Along the base of the tree, you can draw curved lines to show grass growing around the base of the tree. To draw an owl you need to start with the eyes. Draw two large circles joined at the periphery. Draw another set of circles in each of the circle giving it the circular ring feature. Make two small circles in them and color the outer sides of those two smaller circles black. The eyes of the owl are complete. Next, draw a colonel’s collar by joining lines starting from the bottom of the circles culminating at a single vortex giving it the shape of a small V.
Draw a crescent over the two circles without touching the crowns of either circle. Draw inverted small V for ears of the owl which complete the crescent with the circles. Color the crescent black. Also, color half of the ears black. Make a large circle touching either side of the eyes. Draw parallel lines from either side of the colonel’s collar to form a vest. Color the parts outside of the vest black to create the body of the owl. Draw waves in the middle of the vest to create the image of the owl’s abdomen and feathers. To show the owl sitting on a branch, draw a branch of wood closely touching the lower part of the owl. Color the branch black and draw small twigs and leaves for added effect. This is a simple drawing where you draw two heart shapes first. The smaller inner heart can be made by drawing two half paisleys joining head to head to create a V shape. Extend the lines of the paisleys to meet at a vortex in the V shape. Clear the heads. Your small or inner heart is ready. Follow the contour of the inner heart to make a bigger heart around it. To draw an even bigger heart, follow the contour of the middle heart and draw the crown and the tip of the heart. Then draw small semi-circles around the bulge and connect with the crown. Draw more patterns of twigs, leaves, and flowers; simply draw freehand lines along the colonel’s collar. Draw leaves and flowers and buds on the twig. To finish off, draw a freehand flower around the tip of the colonel’s collar. To draw a bird, you need to first define the outline of the bird. This can be done by drawing half Jacuzzi tub and tapering off the end to form a beak of the bird. To draw the rest of the body and feathers, extend the open ends of the Jacuzzi to form feathers and abdomen. Draw any pattern on the body to create wings, markings and tiny feathers of the bird. Make tiny lines on the abdomen to show chest. Draw two strong lines attached to the abdomen to show legs of the bird. Color all the empty space with black color. Are you a drawing artist or just have started drawing? Have you ever thought of showcasing your drawing talent to sell your drawing online? You can try these types of drawing and sell them on Showflipper. You will also find a collection of handmade drawings for sale here, which you can look at for inspiration.